Karen and Richard Carpenter performed and often wrote, some of the greatest love songs of all time. Recreated to perfection by the Carpenters Experience. 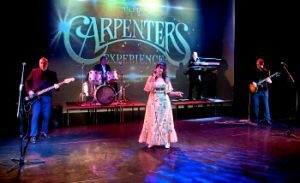 The Carpenters experience has a great catalogue of music to perform and they go about it with all guns blazing. Lead singer Maggie is a hugely experienced show performer with over 20 years in the business. Backed by a highly-talented touring band, this is a show that has been performed across the UK, Europe and Asia. Note – under 16’s must be accompanied by an adult. Tickets £15, available from the Town Hall, or online from Ticket Website.